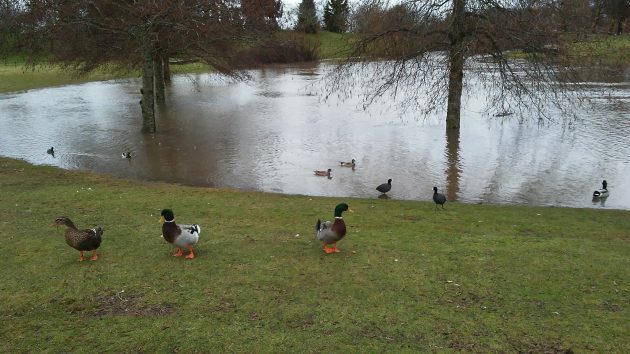 Ducks in Timber Linn Park are among the few Albany residents unaffected by the new rain tax. In case you lost track of the coming Albany rain tax, here’s a reminder: It takes effect March 1 and will start showing up on the city’s combined water and sewer bills next month. The city council enacted the storm water utility charge in November 2016 after nearly two years of study and deliberation. The fee is intended to raise money toward maintenance and improvement of the city’s extensive network of drains, pipes, ditches and other facilities that channel rain water from streets and private properties to the Willamette River. Public Works Directors Jeff Blaine and Chris Bailey reminded the council on Wednesday that the new charge is about to take effect. Based on the experience of Lebanon a few years ago, and despite a publicity and outreach campaign over the last few months, they prepared the council for a surge of customer questions and complaints. The city has six billing cycles for its roughly 18,000 utility accounts, and the first storm water charge will be prorated depending on the cycle. For most residential utility customers the storm water fee will start at $6.74 a month. To help offset the added cost, the council lowered water rates 2 percent and sewer charges 6 percent. So the net increase for most residences in town will average $2.61, according to the city staff. For the smallest 10 percent of residential properties, the charge will be 50 cents less. For the largest 10 percent it’ll be 50 cents more. For nonresidential properties, the charge is based largely on the size of surfaces such as parking lots and roofs. The Target Distribution Center in South Albany and the Albany Public Schools are among those facing the biggest increases, between $1,000 and $2,000 more per month. I guess my question would be, since this is, in all reality, a tax, is any portion of it going to CARA or other projects other than maintaining curbs, ditches, etc. that manage only rainwater???? So, here, we pay more than double what people are paying in los Angeles county for water and sewer, and they are in a drought. And now another fee? I don’t mind the fee, but honestly I wonder about spending. You are correct Michelle. I travel to the Bay Area frequently for work, and a few years back I compared Albany water rates to the Bay Area rates. They were much, much cheaper. This started because they were going to raise the rates on the ‘highest tier’ due to the drought. They were up in arms. But the highest tier, which would only apply to the few folks who keep their grasses ever-green pretty much, was still cheaper than Albany. Now if you could just afford said house in the City by the Bay….. I guess I missed this in the ballot. Did we vote for this or are we paying for water we don’t use? Albany has been kicking-the-can down the road for 10+ years. Not any more. It seems like we are required to pay more and more taxes but yet when you barely make enough to pay rent and pay for the necessities (utility, car, insurance, health insurance, etc) even the smallest amount is big when it has to come out of what little is left for groceries. Getting any help is a joke because if you have a job of any sort, you make too much money to qualify. Seems this vote should have gone public and let people decide. With the rising astronomical cost of rent (mine jumped $200 a month) anymore you have to have a second full time job and the all you do is work 7 days a week and can’t afford to have a life. It may seem like a small amount to you but put yourselves in our shoes. There will be a ballot challenge to this tax. If corporations like the largest coal miners can dump their toxic waste into rivers & streams, why should “we” the citizens care or even pay? First of all, what is the right thing to do? And second? Thank you, btw. Seems like a very unfair tax on all of us. House renters shouldnt have to pay the rain tax, they dont own the the hard surfaces on the owners property. Does this mean they will put some effort into the dog park which is flooded for 5 months a year? There are heaps of bark given free unloaded at the park, lately with signs to NOT leave any, It’s free!